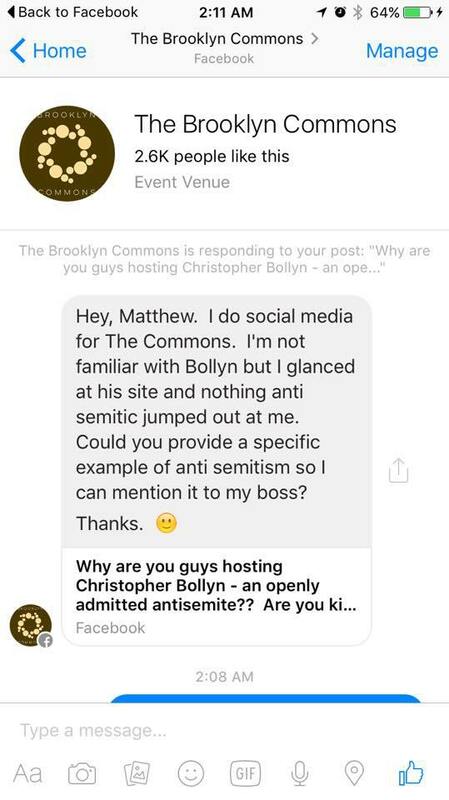 The booking of Christopher Bollyn at the Brooklyn Commons seems to be only the latest bid by the antisemitic wing of the 9/11 Truth and conspiracy movement to find legitimacy in lefty circles. Bollyn, Ken O’Keefe, and others have been speaking at progressive spaces, libraries, and even religious congregations in the recent past with little opposition. Bollyn is a former staffer at a leading racist media project who claims that a “Jewish/Zionist” cabal controls the United States. While this is boilerplate Far Right nonsense, he is speaking on Wednesday, September 7, 2016 at the Brooklyn Commons—a well-respected Left-wing movement space in central Brooklyn. While it takes some chutzpah to speak there, more worrisome has been the refusal of the space to cancel the event. Bollyn worked for the Liberty Lobby from 2000 to 2006, which was run by Willis Carto, who for decades was one of the most important racists on the US Far Right. 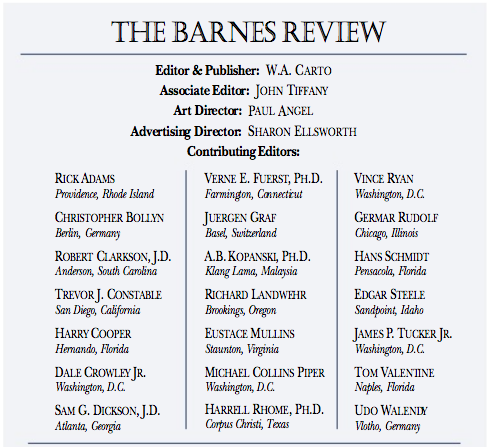 His media group included the Spotlight (now the American Free Press), a White nationalist newspaper (where Bollyn was a staffer), as well as the Barnes Review, the main periodical helping spread Holocaust Denial in the United States (where he was a contributing editor). Bollyn has also appeared on David Duke’s radio show, and has praised the racist paramilitary patrol, the Minutemen Project. Bollyn made his name by promoting an openly antisemitic brand of 9/11 Truth conspiracies in which he makes boilerplate antisemitic claims. Many of these could be taken directly out of 1930s Nazi Party propaganda—that the US government is controlled by a cabal of Jews who force it to go to wars against its national interest. In case there is any lingering doubt, Bollyn is also happy to quote the Protocols of the Learned Elders of Zion, the forgery that is one of the main antisemitic texts that inspired the Nazis. Bollyn’s friends are also engaged in reactionary politics. For example, Nicholas DeVincenzo, the host of the New York event on Facebook, promotes David Duke videos, even tho he says he is skeptical of white separatism. Meanwhile, DeVincenzo’s friend, Rudy Dent, is slated to introduce Bollyn at the Commons. 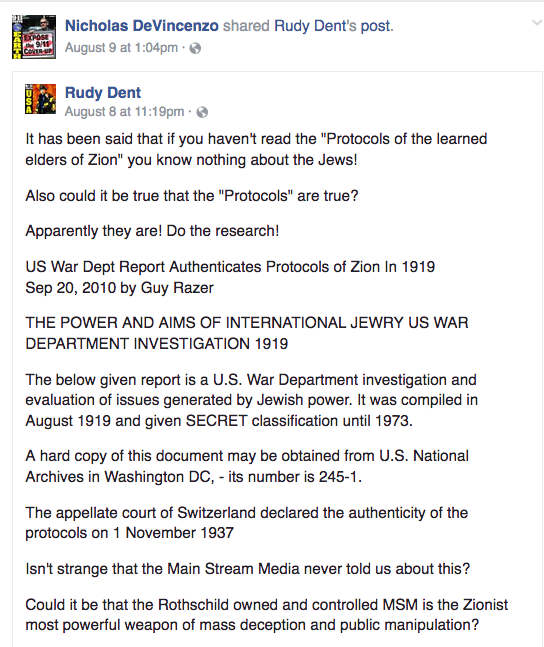 Dent, who is black, promotes the Protocols of the Elders of Zion on his facebook (which DeVincenzo approves of), as well as radical right-wing Sovereign Citizen theories. This just goes to show how antisemitism is often the glue that holds unlikely political bedfellows together, and can create a bridge linking the Far Left and Radical Right. The battle lines are drawn over demonizing narratives that promote oppression. 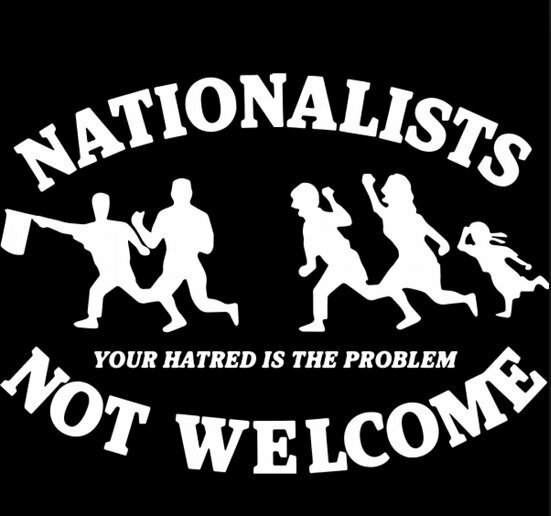 People of any identity can promote narratives of antisemitism and white nationalism, and/or work with those who do. On one side are those who oppose promoting or working with them, and on the other are those who engage in demonization or who promote alliances with those who do. White, black, and other folks—including Jews—can be found on both sides of this line. Similar to Bollyn, Ken O’Keefe has also been making the rounds of progressive circles. He began his career as a legitimate Palestine Solidarity activist but now propagates antisemitic conspiracy theories, including giving a talk praising Adolf Hitler. I’m not sure what’s in the air right now, but whatever it is has given the antisemitic conspiracy theorists a push to try and find legitimacy for their views among the Left. Perhaps it’s the shot in the arm that Trump is giving to all forms of racism and bigotry—but nonetheless, it is clear that the response from the Left is severely lacking in regard to identifying and confronting antisemitism. There needs to be more education about antisemitic narratives and tropes so that people can recognize and reject them. And there should be an understanding about how antisemitism allows for cross-recruitment from, and fusion with, racists and fascists—as we are seeing with Bollyn’s attempts to woo progressives at the Commons. You didn’t know? It’s no longer antis emetic to talk about the “Jews” now as long as you say “Zionist Jews” instead.